My mother managed to always see the best in every situation. I truly believe that her positive outlook helped to extend the length and quality of her life even as she tried to valiantly fight through the metastatic tumors in her body for so many years. But a positive attitude could only take her so far and eventually the tumors won out. My mother lost her battle to cancer in 2004. This loss was a devastating blow to our family. It has forever changed me, and I feel her absence so often. But in true my mother's fashion, I tried to make the best of a really crappy situation thinking that maybe something good could come out of something so bad. Enter my mother's sister who suggested we figure out a way to raise money for a charity close to my mother's heart - Greenwood House, a nonprofit nursing home in New Jersey committed to providing the highest quality care and services to seniors in an atmosphere of compassion and dignity based on Jewish tradition and values. We took the idea and ran with it. My mother had volunteered at Greenwood House for most of her adult life and ran a small card party every year for the home's residents, family members and friends. At the event, attendees enjoyed "cards, mahjongg and conversation." Greenwood House agreed to name the card party in my mother's memory, my family agreed to be the permanent benefactor for the event, and somehow I was put in charge of planning an event, based on a premise I knew nothing about. "Cards, conversation and mahjongg" sounded as foreign to me as just about anything - well maybe not the conversation part. Enter my mother's friends and other Greenwood House volunteers who stepped up to join "my committee." They taught me so much: how to plan a menu, do a seating chart, make bridge score pads, ask for donations, sell raffle tickets, find vendors, fundraise and give back to an organization that has given so much to our community for so long. My own friends got involved too. Together we learned how to play mahjongg so that we could really participate in the event. Much to our surprise, we discovered that we love to play. We laugh, we talk and we even manage to finish a few games. We joke about one day venturing on a mahjongg cruise imagining that we (now in our early 40s) are the youngest people to ever play the game. Apparently that is not the case. I recently learned about a group of much younger ladies (in their early 20s!) who play what was once known as an "old ladies" game. And they too play the game for a good cause. Alexis Miller, who is currently studying for her master's degree in social work, became an avid mahjongg player during her senior year in college. It was then that she took three weeks off of school to go home to suburban Chicago to help take care of her mother who had been diagnosed with breast cancer. She came home to care for her mother during and after her surgery. She took her mother to and from doctor's appointments, changed her mother's drains and served as a friend and companion. While recovering from her surgery, Alexis and her mother would play mahjongg with other friends to help pass the time and to take her mother's mind off the tough recovery. It was her mother in fact who had taught her how to play the game, and Alexis in turn taught her own young friends. Alexis also realized she had an opportunity to try and make something good out of a really bad situation. She and her friends Jordyn Fishman and Moriah Berry (whose mothers had also undergone treatment for breast cancer years ago) came up with the idea of a mahjongg party to raise money for The Cancer Wellness Center in Northbrook, Illinois, a place where all of their mothers had received free support while battling cancer. "Stay Strong and Mahj On" was born in the spring of 2015. The first event took place in Chicago where 155 guests showed up to raise over $15,000 for The Cancer Wellness Center. "Stay Strong" is still doing just with another successful event recently wrapped up in April 2016 in New York. Alexis is currently planning her next event, which will take place on June 12th at The Highland Park Community House in Highland Park, Illinois. Meanwhile, my mother's little card party has grown and moved into the 21st century over the last decade plus. 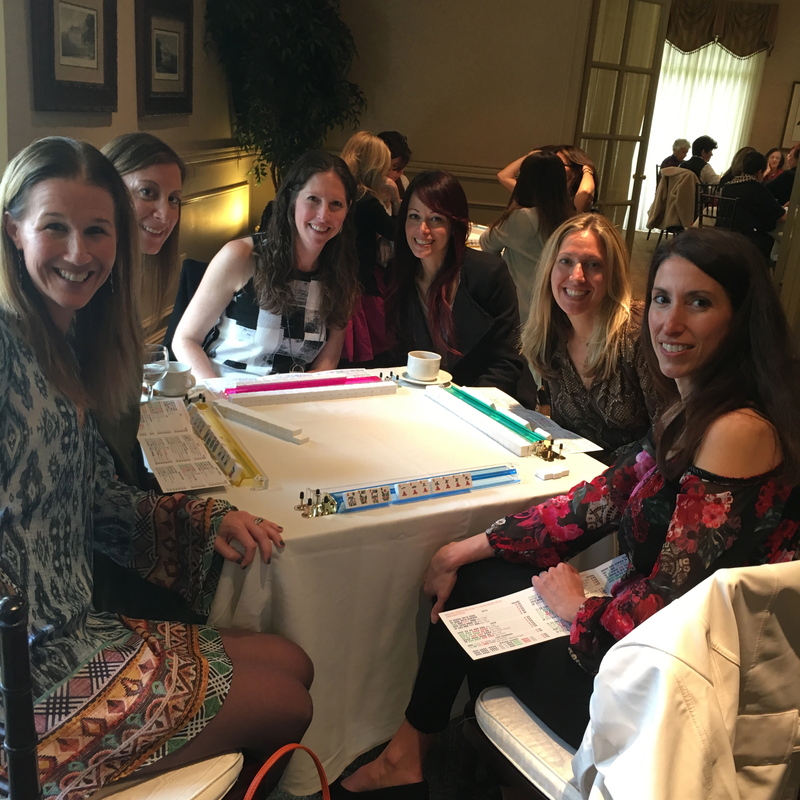 Now known as "The Becky Deitz Levy Luncheon and Card Party" the event outgrew the space in Greenwood House years ago and now takes place at Greenacres Country Club in Lawrenceville, New Jersey. The card party has sold out in recent years with over 200 attendees helping us to raise upwards of $15,000 for Greenwood House. Alexis and I have connected on so many levels. We understand what it's like to watch our all too young mother's undergo cancer treatment. Alexis happily reports that her mother is now cancer free, having successfully undergone a double mastectomy and chemotherapy. We also both understand how helpless you can feel when you are watching someone you love so much go through something so painful. I think that's why we are both all the more pleased to learn that we didn't have to feel helpless forever. At different times in our lives and in different parts of the country, we figured out a way to honor our mothers and to give back to organizations that have meant so much to them. Alexis reported that there was not a dry eye in the room at her last "Stay Strong" event as she spoke about her mother's battle with cancer and presented her mother with flowers. The ladies then played mahjongg together all afternoon. Of course I wish I could do the same with my mother. Instead, though I like to think that I'm doing the next best thing. Every year at the event, so many women come up to me telling me how pleased my mother would be with the card party. I think they are right. I think she'd also be pleased with Alexis's event. I know that I am.